Russian gun? Russian round! 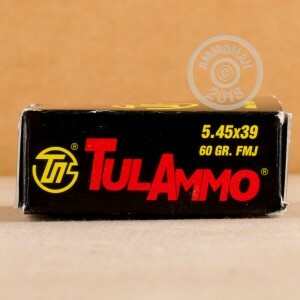 TulAmmo is manufactured at the Tula Cartridge Plant about 100 miles south of Moscow, which has continually operated since 1880. This 5.45×39mm cartridge features that distinctively Russian ammunition feature; the Berdan primed steel casing. Its key advantage is its affordability -- iron is far less expensive than copper, and this round’s price tag reflects that nicely. The downshot is that this cartridge’s casing makes it non-reloadable, but if you don’t intend to reload anyway you’ll find this to be a great option for your AK-74. This cartridge sports a 60 grain projectile. The bullet’s full metal jacket makes it perfect for target practice, as it will stave off the kind of fouling which would quickly have impacted your accuracy. You’ll enjoy flat trajectories thanks to the round’s 2,936 fps muzzle velocity, and its casing also sports a polymer coating to facilitate in feeding and ejection, and to prevent rust or corrosion if you don't get around to shooting it any time soon. 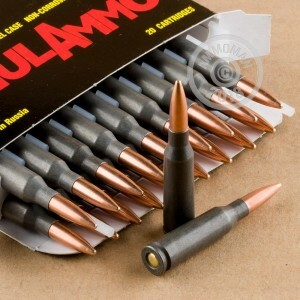 Great ammo cycled and grouped great with my rifle. Dealing with Ammoman is always a pleasure! 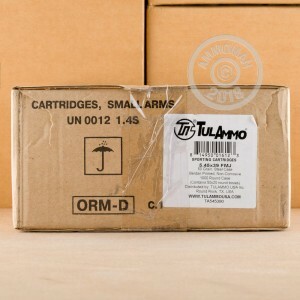 Fast shipping and the ammo is always as advertised!